Follow these chemical-free fixes at the first signs of a partial clog, and you can save your sink from ever going out of order—and yourself the effort of an even larger repair. Q: My bathroom sink isn’t draining very well, and it’s driving me crazy. While the water does eventually drain out, it takes a long time—and, in the meantime, it’s hard to use a sink full of dirty water. What can be done about the slow sink drain? A: If by the time you finish brushing your teeth, you’re leaning over a sink full of water dotted with toothpaste foam, you face a very common problem: a partial clog. While frustrating, a slow sink drain is easy enough for most homeowners to remedy on their own. 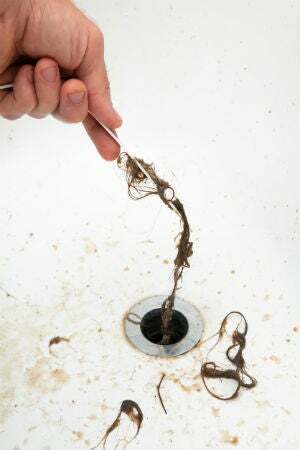 The culprit is generally a slimy mixture of soap scum, hair, sticky styling products, and/or thick shaving foam that has accumulated on the drain walls. While you might be tempted to reach for commercial drain openers right off the bat, know that these harsh and corrosive chemicals can irritate your skin and eyes and even harm old pipes. Since removing the blockage often won’t take any chemicals at all, we suggest playing it safe and following the steps outlined here. Clean the stopper. Because of its position at the mouth of the drain and the metal “tail” that extends a couple inches into the pipe, the sink stopper—the small raised metal device used to plug the sink’s drain on command—tends to catch hair, soap, and other debris. Once this trapped ball of grossness gets too big, wham, you have a slow sink drain. In many modern sinks, you can remove the stopper simply by unscrewing it; in some older sinks, though, a small tether holds the stopper in place. Look underneath the sink, right where the basin connects to the pipe, and you’ll typically see a small rod with a nut and clip attached to the pipe. Turn the nut to detach it—you might need pliers if it’s tight—squeeze the clip to release the rod, and lift the stopper out of the drain. If the stopper is covered in slimy grunge and hair, use a paper towel or rag to thoroughly clean off all of the residues. But don’t replace the stopper just yet; wait until after you’ve remedied the partial clog with one of the following tips. Melt the sludge. A slimy coating along the inside of the sink’s drainpipe will narrow the opening and slow drainage. Pour one-half cup baking soda into the drain followed by one-half cup white vinegar; the fizzing and bubbling reaction helps to break up small clogs. Block the drain using a small rag so the chemical reaction doesn’t all bubble up out. After 15 minutes, pour a kettle’s worth of boiling water down the drain and run hot water for several minutes to further flush out the melted slime. Lift out debris. If cleaning the drain walls didn’t fix the problem, fish out any accumulated debris with a small hair clog tool (sometimes called a “drain-cleaning tool”). Generally made of flexible plastic, this tool features a long stem with a handle at one end and small barbs at the other for grabbing onto hair and other debris inside the clogged sink drain. With the stopper removed, insert the plastic line down the drain, wiggle it around, and lift it out frequently to wipe off whatever you hook. Continue to do this until you can no longer pull up any blockage. Use a plunger. Sometimes the clog is further down the drain than even a drain-cleaning tool can reach, but a sink plunger can help. For the best results, block the sink’s overflow hole with a small rag. Place your cup-shaped sink plunger—not a toilet plunger, which has a flange for sealing a toilet’s outlet—over the sink drain. Fill the basin with enough water to cover the plunger’s cup. Now plunge up and down in short, quick movements to force as much air as possible down into the drain. If the clog dislodges, you should see the water in the sink quickly drain away. Snake it. If you’ve tried all of the above steps but are still stuck with a slow sink drain, it’s time to get a bit more aggressive. Pick up a drain snake (also called a drain auger) from the home improvement store; this metal cable extends anywhere from three to 25 feet long with a spiral catch at the other end so you can dislodge clogs located beyond the reach of a sink-cleaning tool or plunger. With the stopper removed, insert the tip of the snake into the sink drain. Feed the snake further down the pipe, periodically retracting it to clean away any accumulated grunge. (Keep a trashcan nearby, as you’ll need somewhere to toss whatever comes out of the drain.) 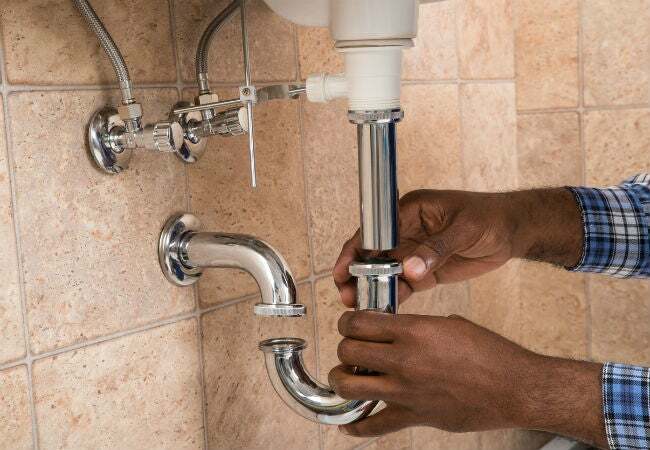 If you feel a block in the pipe, crank the drain snake’s handle to break through and wiggle the tool gently from side to side to catch the clog. Once the snake has a little give again, remove the snake and its contents and flush the drain with hot water. Check the trap. Look underneath your sink and you’ll see a U-shaped bend in the pipe. This is the P-trap, and while its purpose is to maintain a small standing pool of water to prevent sewer gas from backing up into your home, it’s also a prime spot for loose change, lost rings, debris, even lost toys to accumulate. Before starting, turn off the water supply to the sink and clear out any belongings stored under the slow sink drain except for a bucket directly underneath the P-trap to catch dirty water. In most homes, the P-trap is held in place by slip nuts at each end of the curved pipe. These are usually plastic but can be chrome in older houses. Twist the slip nuts counterclockwise with your fingers or a wrench and, once the slip nuts are loosened, lift away the P-trap section of pipe. Use your gloved fingers, a stiff brush, or an unbent coat hanger to push out any apparent blockages. When the job is done, reattach the plumbing, tighten the slip nuts securely, and don’t forget to turn the water back on! Keep things flowing with a little preventative maintenance. Since a slow-draining sink is a problem that gradually escalates over time, you can minimize the chance of making a day of this by following a few basic precautions. • When you see loose strands of hair in the sink, toss them into the trash rather than washing them down the drain. The same goes for gobs of toothpaste and soap: Better to wipe up than rinse away. • If long hair often ends up in the sink, cover the stopper with a plastic or wire mesh hair catcher to collect hair before it goes down the drain during your grooming routine. • Knock dirt and any other thick, heavy, or sticky materials into the trash before washing up. 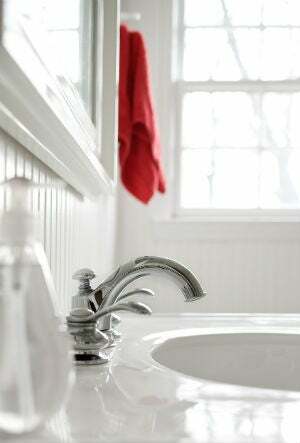 • Make cleaning the sink stopper a part of your regular bathroom cleaning routine. Lift it out to wipe away hair, scum, and residue weekly. 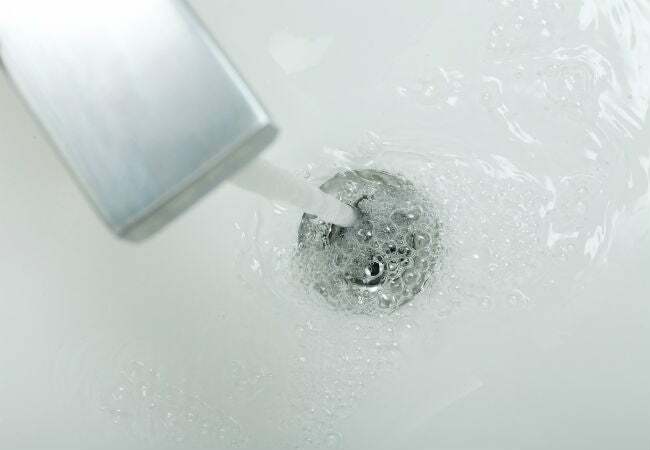 • Regularly flush out the drain with very hot water to help melt away soap scum and sludge. • Once each month or two, remove the stopper and pour a tablespoon of table salt and a quarter-cup of white vinegar into the drain, flushing the mixture away with hot water. This combination should loosen stubborn grunge before it builds into a clog.